LanzaTech has developed a fully sustainable integrative gas to fuels and chemicals platform that has no impact on food, water security or high biodiversity land use. LanzaTech’s gas fermentation platform disrupts the current highly centralized global energy system by enabling the regional production of low-cost energy from local wastes and residues, including gases as varied as industrial flue gas, gasified biomass wastes and residues, biogas, and high-CO2 stranded natural gas. The company was originally founded in 2005 in New Zealand. The proprietary gas-to-liquid platform produces fuels and high value chemicals such as 2,3-butanediol (2,3 BDO) and acetic acid from a variety of waste gas resources. 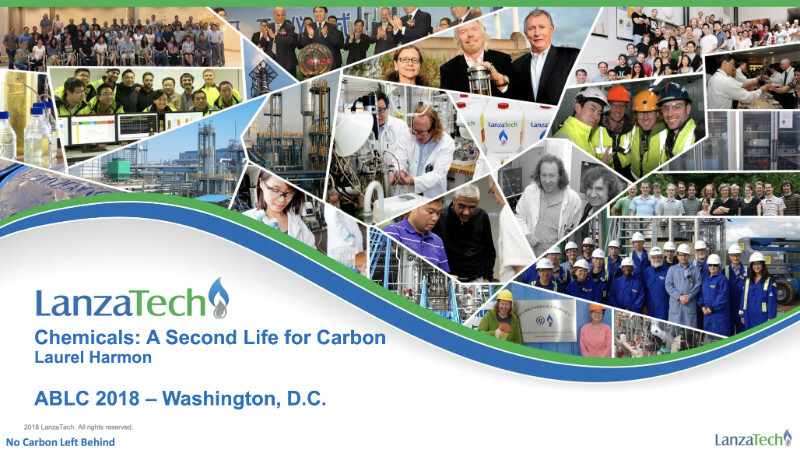 LanzaTech’s Laurel Harmon gave this illuminating overview on LanzaTech’s chemicals progress and promise at ABLC 2018 in Washington DC.